An innovative publisher of Genre Fiction and New Pulp, Pro Se Productions announces the release of its latest series in its Pro Se Single Shot Signature line. Author Russ Anderson, Jr. takes flight with the newest Pro Se Single Shot Signature Series-Fly Girl and its first book- The Origin of Flight! 16 year old Caryn Clay is a Phoenix, Arizona girl who would be perfectly happy if you never mentioned (or even noticed) the fact that she’s half-Navajo. She’s never been comfortable with that culture, and she’s never made any bones about that... so she’s more than a little surprised when her Navajo grandmother wills a genuine Thunderbird feather to her - especially when she finds out that the feather grants her limited control over the weather and the ability to fly. Before she can adjust to all of this, a maniac with seemingly unlimited magical power named the Trickster takes her friends hostage, and she must use her own powers—powers she barely understands—to save them. 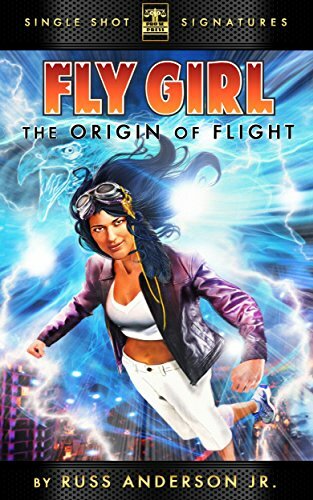 The Origin of Flight: Fly Girl Book One features a fantastic cover and logo design by Jeffrey Hayes and cover design and ebook design and formatting by Russ Anderson is now available for 99 cents via Amazon, Barnes & Noble, and www.smashwords.com. For more information on this title, digital review copies, or interviews with the author , contact Morgan McKay, Pro Se’s Director of Corporate Operations, at directorofcorporateoperations@prose-press.com.